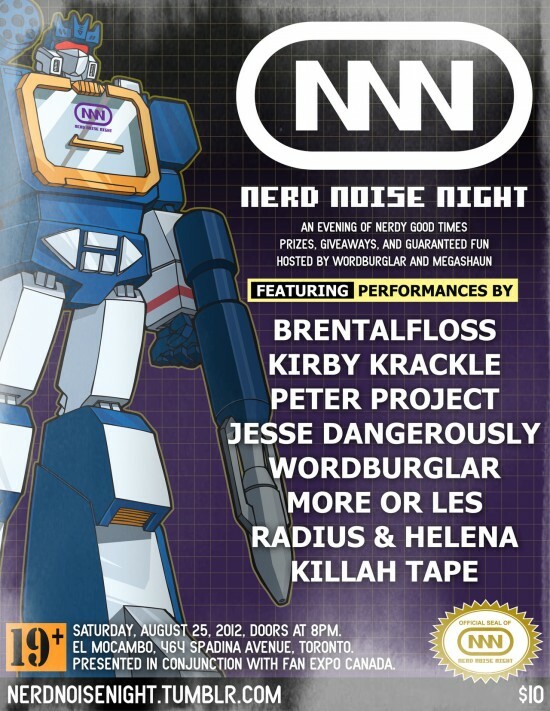 Those of you in the Toronto area may be interested in checking out Nerd Noise Night at El Mocambo (464 Spadina Ave @ College St)… It’s the musical celebration for Fan Expo, and this year Wordburglar returns along with fellow Backburner-ers Jesse Dangerously and More Or Les, as well as Peter Project who mixed the second volume of Grandpa Funnybook’s Mix-Tapingly Arranged Rapping Song Album, which will be available at the show as well as at our booth at Fan Expo during the weekend of August 23-26. Did I mention Hand’Solo Records will be at Fan Expo this year with a booth just on the periphery of Artist’s Alley? If you’re making the trip to Fan Expo, come say “hi” or “what’s up” or whatever the hip new lingo is these days… And check out the Nerd Noise Night, too.